Tiruvengadamudayan promised Sumatirajan to give darshan as Parthasarathy and had the Vigraha Pratishta by Atreya Maharishi. Hence this Kshetra is also called Second Tirupati. Utsava Moorthy Parthasarathy has scars on the Divine face caused by Arrows from Bhisma while He was Charioteer to Arjuna during the Mahabharata war. Once Saint Veda Vyasar has sent one of his disciple called Saint Athreya to Brindhaaranyam (Triplicane was formerly called as Brindhaaranyam) for penance. Saint Athreya carried with him a Divya Mangala Statue of Lord Krishna holding Conch on one hand and Dhaana Mudra on the other hand. At Brindhaaranyam Saint Athreya met another saint called Sumathi. Both of them installed the Divya Mangala Statue along with the statue of Lordess Rukmani there, worshipped and attained Eternal. 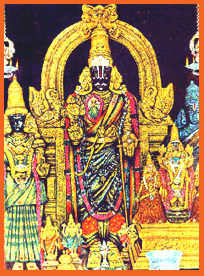 Lord Venkateswara ordered King Sumathi to go to Brindhaaranyam and worship the Divya Mangala Statue as Venkata Krishnan. Here Lord Vishnu has appeared in five forms. 1) Lord Vishnu appeared as Lord Narasimha on the request of Saint Athiri. 2) Lord Vishnu appeared as Lord Rama along with Lordess Sita, Lakshmana, Bharatha and Sathrukna on the request of Maharishi Madhumaan. 3) Lord Vishnu appeared as Gajendravaradhar on the request of Rishi Saptharomar. 4) Lord Vishnu appeared as Lord Venkata Krishnan on the request of King Sumathi. 5) Lord Vishnu appeared as Lord Renganathar to make Himself identified as Lordess Vedhavalli's Husband when Lordess Vedhavalli was brought up by Maharishi Bruhu. Lord Vishnu also appeared as the Chariot Rider for King Arjuna and was called as "Parthasarathy" (Utsavar). When King Bheeshma send the series of arrows on King Arjuna, Lord Krishna being the Chariot rider got all the arrows on Him. The mark of those arrows are still found on the Utsavar statue of "Parthasarathy". This is the only Divya Desam in the 108 where the Lord manifested Himself with a big mustache. As Lord Venkateswara of Thirupathi Himself appeared here as Venkatakrishnan, the Saturday of Tamil month "Puratasi"(Sept - Oct ) is suppose to be auspicious. Vaikunda Ekadesi falling in the tamil month "Markazhi" (Dec - Jan ) will also be celebrated. Located right in the heart of Chennai Metropolitan City. PLUS:Very near to Thiru Allikeni is Thiru Mylai; where in you can worship Lord KesavapPerumal, in whose temple's well, Peyazhwar had His divine incarnation. 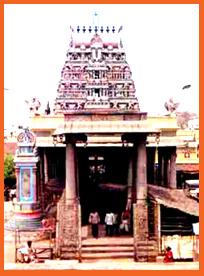 Temple is located on the centre of the Chennai between Triplicane and Ice House. The streets approaching the temple will be small and crowdie. It is located on the sea shore of Marina Beach.